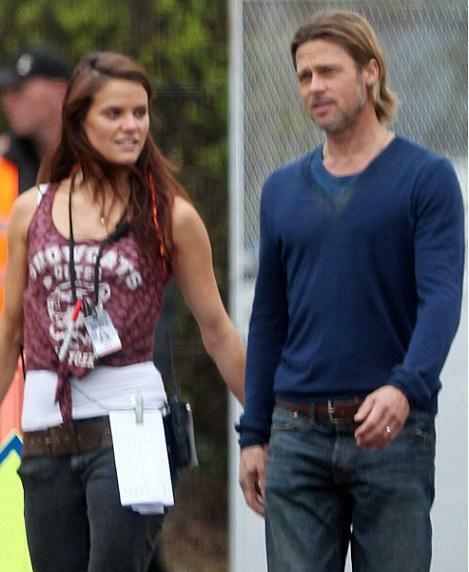 During his shootings for the World War Z in UK, Brad Pitt has been seen spending time with a brunette who was shadowing him everywhere. Despite the rumors that they were seen flirting, Angelina has nothing to worry about as the woman is only Brad’s assistant. Seeing Brad Pitt walking beside a woman, no matter her name, age or status, is always a subject of gossip. So it is not something out of the ordinary to make it a national incident when pictures like this came out. The Hollywood star, who is 47 years old and a father of 6 children was in a break. He was wearing a v-neck blue sweater and comfortable jeans. If anything struck about his look, it was the slightly grown grey beard which went perfectly with his blonde locks. His assistant was wearing an identification card hanging from her neck down and a pen hung on the string of the card, just in case she needed to write down some of the star’s claims. She had a matching style outfit (to Brad’s): jeans, sports top featuring a drawing of a cat’s head and the slogan Showcats across the front. After filming in Malta for his upcoming movie, World War Z, Pitt flew to the UK together with his family. Angelina and the two girls, sweet Zahara and tomboy Shiloh, spent some quality time with their husband and dad in Malta, then accompanied him to England during the weekend. Then they got back to L.A. leaving Brad to his job. World War Z is a horror story based on the novel of Max Brooks, “World War Z: An Oral History of the Zombie War”, which was released in 2006. The book came as a follow-up to “The Zombie Survival Guide” released in 2003. The movie is about a zombie epidemic that spreads around the world in an extremely short time and forces the people who remained untouched by the disease to withdraw and hide. From this point on, the battle for survival of the human specie begins.